It's always exciting to hear about new cupcake shops opening, especially when they are close to home. See where two of my favorite shops are expanding to and where the newest cupcake shop in southern California will be. SusieCakes has opened a new bakery in northern California, Greenbrae to be exact. The new bakery is having a grand opening party on Saturday, January 23 from 11am-4pm. There will be prizes, sample, face-painting, ballon artist, and music. SusieCakes in Greenbrae will also be doing a Golden Ticket Contest, similar to the contest they did in Newport Beach during the summer. Crumbs Bake Shop has opened a new shop in Ridgewood, NJ. The new shop opened on Monday, January 18. Although this shop is far away from me, it's still interesting to see where cupcake shops are expanding to. Thanks to Cupcakes Take the Cake, I discovered that a new cupcakery will be opening in southern California. 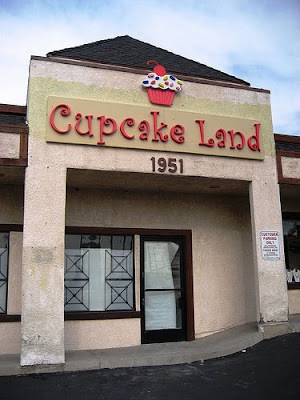 Cupcake Land is located in La Habra, CA. Their website is under construction so I don't have much info about them, besides their address.